Healthy eating with a balanced diet. If you are looking around for some healthy balanced diet lunch meal ideas, here are some worth trying out. Not only are they healthy, they are also delicious and low in calories. Just what the weight loss doctor prescribed! As mayo-rich chicken salad leads to more than 500 calories per serving, substitute the mayo with nonfat Greek yogurt for the same texture and tang sans the calories. Served over a bed of lettuce and tucked into a pita pocket or toasted English muffin gives a light but filling lunch. Required ingredients- 2 large poached, boneless and skinless chicken breasts, ¼ cup nonfat Greek yogurt and slivered almonds and 1/3 cup diced celery, diced apple and halved grapes. Dice the poached chicken breasts and place in a large bowl. Mix in Greek yogurt till the chicken is evenly coated. Add in other ingredients and mix. Enjoy and store the remaining salad in the fridge. Did you know that eating a rainbow will help you get back your slimmer self? A rich combination of bright and vibrant colored foods like fresh veggies are not only low in calories, but also have more fiber than other colored foods like pasta and bread. So you tend to lose weight, without going hungry. Don’t think this means you have to eat a boring green salad. There are some hearty variations like this recipe consisting of cooked quinoa for protein and fiber with vegetables. Not only is the quinoa vegan and gluten free, each bowl is only 360 calories with 15 gms of protein and 7.8 gms of fiber. Required ingredients- A cup of rinsed quinoa, 2 cups of water, 3 medium peeled and diced carrots, ½ yellow and red pepper diced, 1 cup chopped red cabbage, 2 tablespoons sesame oil and rice vinegar, ¼ teaspoon salt, 1 tablespoon fresh minced ginger and a tablespoon sesame seeds. Place the quinoa, water, and salt in a covered pot and keep on high till it boils. Lower the heat and cook for about 15 minutes or till the quinoa is soft and water absorbed then pour into a medium-sized bowl. Mix in the carrots, cabbage, and peppers. Make the dressing in a separate small bowl by mixing rice vinegar, minced ginger, and sesame oil and sesame seeds together. Pour the dressing over the quinoa, mix the veggies thoroughly and enjoy the dish as desired. 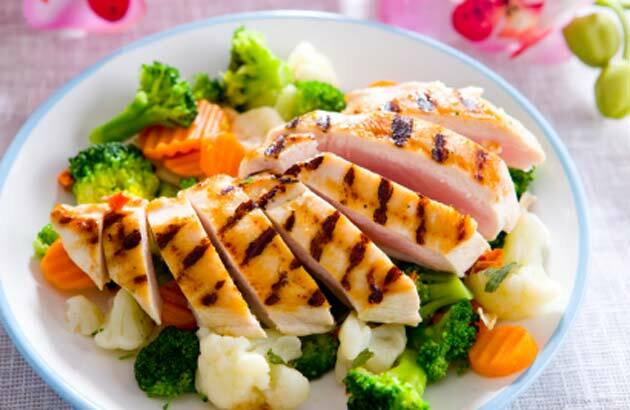 Besides eating healthy balanced diet lunch meal ideas, there are some lunch mistakes to avoid. No matter how busy you are, don’t wait till you are famished to have lunch. This only leads to your quickly eating your lunch and reaching for more food as your body hasn’t time to register that it’s full. It also throws off your natural hunger pangs for the rest of the afternoon to lead to more eating later on. Don’t eat out as even café soup and salad carries more than 600 calories. Pack your own lunch from home to know exactly what you eat. Do not eat lunch while doing something like working or watching TV. Your mind ends up too distracted to fully register each bite wherein you end up eating or craving more food.